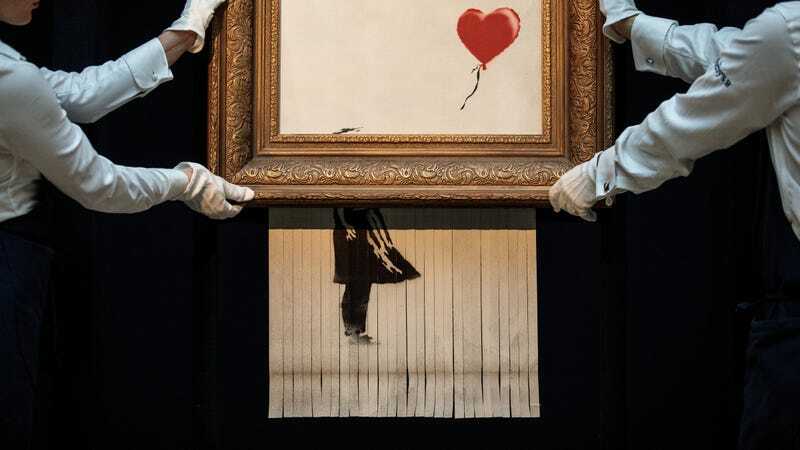 Banksy, that scamp, caused the art world’s collective monocle to shatter when a print of his iconic “Girl With Balloon” self-destructed after being purchased for more than $1.2 million at a London Sotheby’s. There’s been plenty of speculation as to whether the event was staged with the auction house—signs point to “no”—and if the piece’s price would subsequently rise, what with an art piece’s value being as prone to circumstance as merit. Sotheby’s agrees. In their statement, they say the stunt “marked the first time a piece of live performance art had been sold at auction.” That’s one way of saying you weren’t trolled. The piece, now called “Love Is In The Bin,” will be on display at Sotheby’s Bond Street Galleries this weekend, October 13 and 14.